The BBC's ExoMars: Where to send Europe's robot rover? discusses the decision-making faced by the ExoMars Site Selection Working Group. 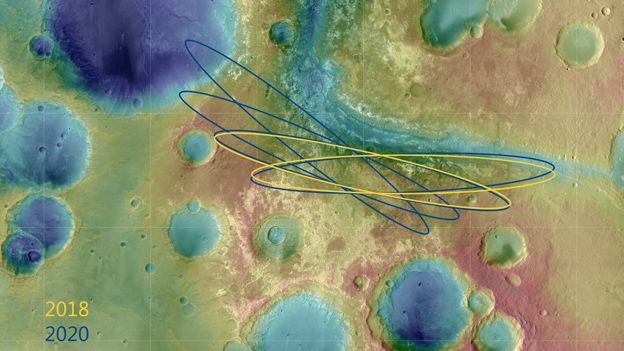 The working group will spend Thursday and Friday discussing the merits and shortcomings of Oxia Planum and Mawrth Vallis. Question: Why would a launch in 2020 have more flexibility in landing-ellipse inclination than a launch in 2018? I wonder if this is orbital mechanics, or just logistical, or they just decided to add more ellipses, or is it something more interesting? It may be hard to see due the choice of colors, but for each landing site center there are two ellipses drawn for 2018 (in yellow) but four ellipses for 2020 (in blue). The four include the pair from 2018 but also show two additional ellipses with much higher inclinations. 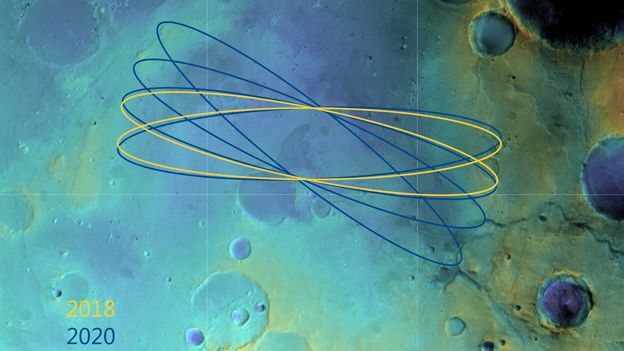 My answer is based on the article: "Selecting a Landing Site for the ExoMars 2018 Mission". In section 5 "LANDING SITE’S ENGINEERING CONSTRAINTS" the authors provide a list of the different constraints: Latitude, Elevation, Landing ellipse, Landing ellipse azimuth and more. In this list, it is mentioned that: "For a 2018 launch, the landing ellipse azimuth can be between 90° and 102°. For a 2020 (backup) launch, the landing ellipse azimuth can vary from 113°–127° (at the beginning of the launch window) to 88°–103° (at the end of the launch window). "Landing ellipse azimuth: The landing ellipse azimuth will change depending on when the mission is launched during the window (usually two weeks long). In the case of ExoMars 2018, this change is more manifest for the 2020 backup launch than for the regular launch in 2018." It is important to note that the article was published in 2015 and since then the project may have added design constraints. In a different paper (ExoMars Landing Site Characterisation and Selection), the authors mention another difference between the 2018 and the 2020 launch. "For a 2018 launch, Oxia Planum is the leading candidate landing site and its site characteristics e.g. rock abundance , aeolian cover and predicted atmospheric conditions, are currently being checked. For a 2020 launch, Oxia Planum is one of the two candidate landing sites, with a second to be selected from Aram Dorsum and Mawrth Vallis during 2016." It seems that the 2018 launch offer just one interesting landing site while the 2020 offer two candidates. Not the answer you're looking for? Browse other questions tagged orbital-mechanics esa planning exomars or ask your own question. Why is geosynchronous orbit an altitude, rather than a velocity? Why can't we deorbit to earth more gently? Why does NASA and other space agencies seem to rarely if ever complain over the state of the budget? How can Bielliptic transfers be more efficient than Hohmann transfers? Will asteroid 2015 YA have a collision with Venus in october 2018?